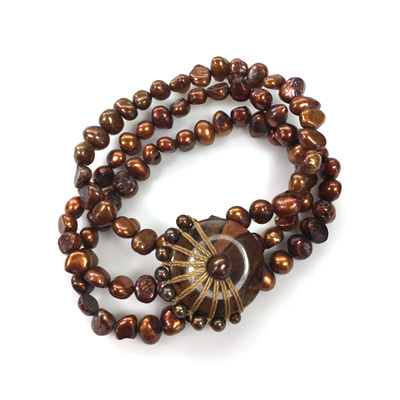 These fresh water pearls were dyed to gorgeous bronze color. The central gemstone donut was sold to me as brown turquoise, but it might be a fancy jasper as it seems a lot harder than turquoise. Its color matches the pearls perfectly. The freshwater pearls are on elastic cords making this bracelet easy to put on and take off. One size fits all. Freshwater Pearls on elastic cord. 'Brown turquoise' jasper donut 25 mm in diameter. Knotted with nylon thread and freshwater pearls.